Dr. Karan Singh is one of the most ubiquitous politicians in India. 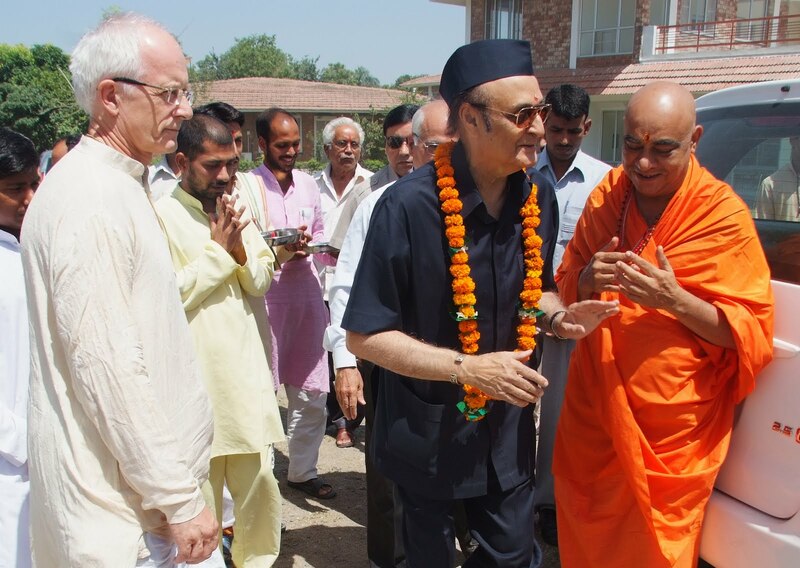 He was just recently in Vrindavan opening the Vaishno Devi temple there. Yesterday he was at Paramarth Niketan offering arati to the Ganga and today he decided to drop in on his way back to Delhi. The ashram is pretty thin in terms of representation. If anything, that is a serious problem with the ashram itself. Swami Veda left yesterday and now, suddenly, a sannyasi from South India named Devatmananda Swami, who has been here on a visit for two days, and I are the spiritual leadership of the ashram? The three SUV cavalcade came rolling in the requisite half an hour late. 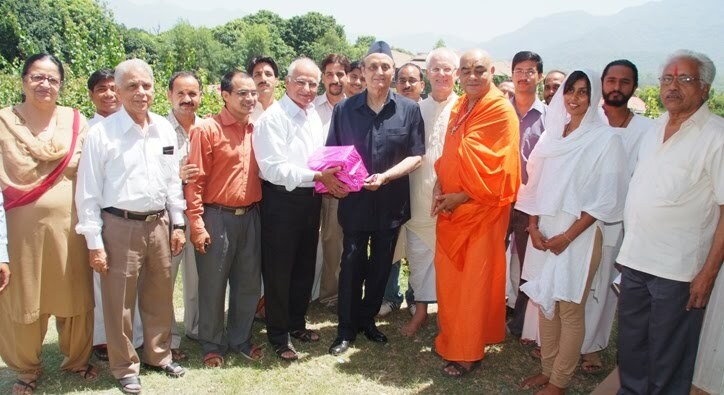 Karan Singh stepped out, wearing his trademark navy blue shirt and Congress cap. Though he has been around forever, I was a bit surprised to see him show difficulty walking, though no one had to come to his aid. On the other hand, his face seemed bright and younger than his age and his brain and speech are obviously sharp and clear. Harshananda and a few Gurukula brahmacharis came and chanted some Vedic mantras of greeting, which Singh himself joined in chanting; he was given garland and tilak. We were prepared to show him around the ashram, but his disability prevented him and we came and sat down in the Mandala Office. 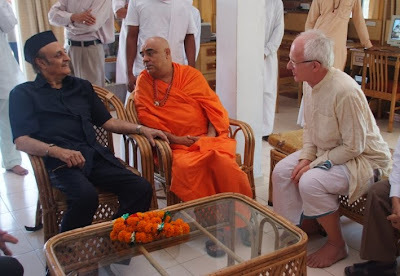 Dr. Singh gave most attention to the Swamiji, but on being told that I was the Sanskrit teacher, turned his attention to me. He asked me what I was teaching and I told him the Ishopanishad. With that, he immediately began to speak of his love for the Upanishads. He said that he felt that there are four yogas--jnana, bhakti, karma and raja. His jnana-yoga is in the Upanishads, his bhakti is for Shiva; his karma is in the various kinds of seva to which he has dedicated his life, and raja yoga, "though I am weakest in this" is what holds the others together. "If someone exclusively practices one or the other, he may in some rare instances be able to achieve perfection, but for an ordinary person who wants to live a balanced life, all are necessary." I concurred. And so we turned to a discussion of the Upanishads. He is a learned man who has written a translation and commentary on the Mundaka Upanishad, and a raja besides -- enough said. Because of reading and preparing a course on Ishopanishad and had formed an opinion on the question, I asked him what he though jugupsate meant in verse 6. He gave a standard answer and we quickly moved on to other things. He correctly said that the Ishopanishad is difficult because of all the oppositional and apparently contradictory statements in verses 9-14. I asked him what he thought was meant by vidyā and avidyā, sambhüti and asambhüti, and he said parā vidyā and aparā vidyā without saying what it really meant. I wasn't quite satisfied, but we were just amusing ourselves. I took the Vaishnava position and actually quoted Bhaktivedanta Swami on his understanding of these verses. So he turned to bhakti and chanted a nice sragdhara verse in praise of Shiva. And talked about the several temples to Nataraj Shiva he has built. I said, "One thing that Shiva and Krishna really have in common is that they both love to dance." And he said, "Only thing is, Shiva dances alone while Krishna dances with the gopis." Then, for my benefit, he quoted this famous verse from Mukunda Mala, which he said he always uses to conclude his lecture on the Bhagavad-gita. At the last moment after this group photo, I spontaneously said, "Radhe Shyam!" But then, conscious of his presence, I said, "Jai Nataraj!" and he gave me a big smile. And off went the cavalcade.